One of the most useful functions of a modern lathe is its ability to cut any form of external or internal thread of any thread form, pitch or diameter within the overall capacity of the machine. Detailed information of a practical nature is, however, not easy to find - a situation that this book does much to rectify. The author was a very experienced engineer with the capability of converting factual analyses into easily understood forms. His own expertise and the standards to which he worked are evident in his writing, and in addition he is also quite at home with both imperial and metric measures having considerable experience in the conversions required when working in partially metricated areas. This book is not only an invaluable treatise on lathe screwcutting but is also a useful demonstration of working in both imperial and metric standards. Introductory Notes. Principles of Lathe Screwcutting. Gearing an English Leadscrew for Metric Threads. lathes with Metric Leadscrews. Problems and Analysis of Repeat Pick-Up. Multiple-Start Threads. Single Point Lathe Threading Tools. Practical Aspects of Lathe Screwcutting. Practical Thread Sizing Measurement. List of Tables. 'Martin Cleeve' was the pen name of Kenneth C. Hart, a respected contributor for some thirty years to Model Engineer magazine. 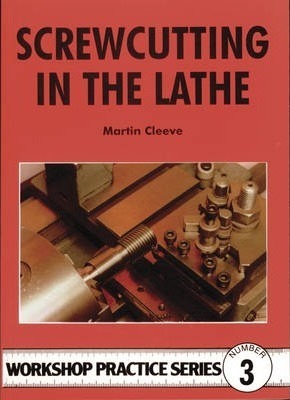 His painstaking, perfectionist approach to high-quality, accurate work (which so clearly comes through in this book as in all his other writing) led him to design and describe many original lathe accessories which have been made and regularly used in hundreds of amateur and professional workshops.